Chopard's Happy Diamonds Clover Necklace is endearingly crafted from shining 18k white gold and richly colored rose gold. A .05CT weight round cut diamond sparkles playfully from the center of this symbol of luck and prosperity. 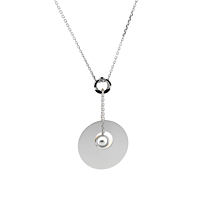 The modern Y-silhouette pendant chain style ensures that the wearer will enjoy a flattering drape that shows off this unique piece.